Upon Starting P90X I realized that I was going to either need a full set of weights or a good set of resistance bands. Money and space being constraints for me I decided to go with the resistance bands. After searching the internet I decided to go with the Bodylastics Resistance Bands. They are one of the few types of resistance bands that have a metal clip on the end of each band, which is used to connect each to the handles, or one of the other attachments. This allows you to combine multiple bands to achieve your desired level or resistance. This is the major shortcomings of most of the other sets of resistance bands I found on the market. They also offer some serious resistance. 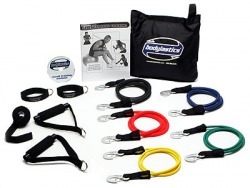 The Bodylastics Max Tension set I purchased has up to 137 lbs of resistance! There basic set still comes with a formidable 88 lbs of resistance! They also recent launched their Bodylastics Strong Man Edition that features up to 254 lbs. or resistance! So do not just dismiss resistanace bands thinking that they are not strong enough, and that that you need the resistance of real weights. Bodylastics Reisistance bands can offer just as much resistance as any set of free weights. Check out the video below to see the Strong Man Edition of Bodylastics in action. Just started using these. More to come after I have used them for a few more weeks.